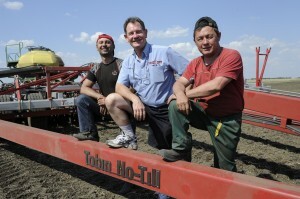 Tobin No-Till has completed the first seeding trials in Kazakhstan. The 56 foot Tobin No-Till disc planter was shipped to one of the largest farms in Kazakhstan and assembled by a team of local workers and Tobin supervisors. Noel Tobin, Managing Director of Tobin No-Till was there to oversee the trials and show farmers the correct planting technique. Farm machinery in Kazakhstan is generally quite old and outdated and productivity has suffered as a result. Observers of the trials found it hard to comprehend the speed and accuracy of the Tobin No-Till compared to the equipment they have been using. A second Tobin planter is currently being shipped to the same property. Tobin No-Till had strong interest from farmers at Agricultural Expos in Astana in Kazakhstan and also in Moscow recently.